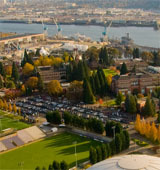 The Roman catholic-affiliated University of Portland offers schools of business, education, engineering, nursing, and arts and sciences. A good percentage of the students here participate in study abroad programs in Austria, England, Japan, and other nations. What is a typical University of Portland student like? Describe the type of person that should attend University of Portland. What are the top 3 reasons someone should attend University of Portland? To find friends they failed to find in high school. To learn in a thriving environment. To prepare to respond to the needs of the world and its human family. What was a typical University of Portland student like in high school? Describe the type of person that should attend University of Portland. As of the 2011-12 academic year, some 3,800 University of Portland students and approximately 320 faculty members are engaged in teaching and research on the campus founded in 1901 and once on the edge of the American wilderness. The University has been ranked 17 years consecutively in the top ten for western regional universities by U.S. News & World Report, and in Barron's Best Buys as one of the best teaching universities in the West. It also has been ranked by Bloomberg BusinessWeek as the best return on investment for any university in Oregon and for five consecutive years has been on the President's Higher Education Community Service Honor Roll. In 2011, the University of Portland was named the top producer of Fulbright scholars in the nation among "master's universities" for the second consecutive year, according to the Chronicle of Higher Education. The University had 10 alumni win the prestigious grants to work and study abroad for 2011-12. This was the second top national ranking the University received in as many months - Washington Monthly ranked the University number one nationally among peer institutions for its commitment to community service. In 2010, the University ranked No. 1 nationally among its peer institutions in producing Peace Corps volunteers per capita, with 23 undergraduate alumni serving worldwide. Also, in 2010, the University of Portland was one of 25 schools rated nationally by Parade magazine as an "A-List" college for its programs in health sciences (nursing) and in business and accounting. Five new buildings were dedicated in 2010, including two new residence halls, a landmark bell tower, an expanded dining center as well as a renovated engineering building. In December 2010, the University announced the public phase of the RISE campaign, with a goal of raising $175 million over the next several years, which would result in one of the largest development campaigns ever for a Pacific Northwest private college or university. The University of Portland was founded in September, 1901 by Portland Archbishop Alexander Christie, who had purchased property atop Waud's Bluff with financial assistance from the Congregation of Holy Cross in Sound Bend, Indiana. Archbishop Christie named the school "Columbia University" after the mighty river that flowed nearby, and when it opened its doors, it was staffed with priests from the archdiocese. Columbia University achieved junior college status in 1922, and in 1925 the College of Arts and Sciences was founded. Four years later the first bachelor's degrees were awarded to a class of seven men. In the 1930s, the University's name was changed to the University of Portland, the St. Vincent Hospital School of Nursing became part of the University as the College of Nursing, and the School of Business were created. In 1948, the School of Engineering was created. The University established its Graduate School in 1950 and the School of Education in 1962. In 1967 the Congregation of Holy Cross and the University's Board of Regents transitioned to a shared governance structure. Today, the University continues to be guided by the Congregation of Holy Cross and governed by an independent board of directors. What are the top 3 things that students do for fun at University of Portland? The average student pays $30,273 for tuition, fees, and other expenses, after grants and scholarships. Total stated tuition is $36,700, in-state and on-campus, before financial aid. Learn more about financial aid at http://www.up.edu/finaid/. Estimate the net price for you at http://www.up.edu/finaid/costcalculator. The typical (median) early career salary of University of Portland graduates is $47,500, according to Payscale. University of Portland participates in the NCAA Division I-AAA for college athletics. Want more info about University of Portland? Get free advice from education experts and Noodle community members. How challenging is the University of Portland nursing program? At University of Portland classes range from easier to more difficult, not much different from any university. You will find easy classes and difficult classes at any university.